Duvet covers have become quite popular these past years. There are a lot of people who would like to use it in their bedroom to make sleeping comfortable and their room luxurious. There are many consumers who shop for duvet covers for their bedroom. What is a duvet cover, you may ask. Basically, a duvet is a cover that contains down fill which can be foam, cotton or duck feathers. It is also referred to as down comforter. It is widely used in European countries and it has become a must-have for American consumers. Duvet covers are designed particularly to cover the duvet and prevent it from getting dirty. It also protects the duvet from allergy-causing dirt particles. 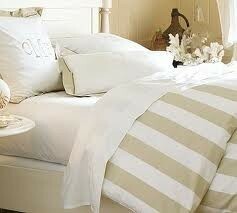 Besides its health benefits, duvet covers can also make a room look better as it comes in different designs. You can also choose covers that suit your bedroom’s theme. Because of its cost, duvet covers are considered as investments. There are different brands and styles and this can make it confusing for consumers to know which one to get. Here are simple tips on how to buy the best duvet covers for your home. Most duvet covers are made of cotton fabric with high thread count. There are covers made of silk or a cotton and silk blend but cotton is the most popular material used because of its comfort and low-cost. This type of bedding uses high thread count fabrics because the down fill are usually very fine and it can easily leak through fabrics with low thread counts. However, high thread count does not necessarily mean high quality. There are fabrics that have high thread counts but use fine cotton threads resulting in a duvet cover that is not as durable as fabrics with stronger threads. Cotton is the most common fabric used for duvet covers, as mentioned. Cotton fiber is quite versatile as it can be designed with different patterns. Its texture also allows it to take on dyes easily. The fabric is soft, comfortable and breathable making it better than other types of fabric. There are covers made of a cotton and polyester blend. While polyester makes it resistant to wrinkles and more durable, it is not as soft and breathable as cotton. Getting a cotton and polyester blend cover means you will get the comfort and durability because of the fabrics. Faux Suede is 100% polyester fabric. It looks and feels like real suede. While you may think that getting real suede would be better, the truth is that faux suede has its advantages. It is easier to clean and it is also less expensive. You will also have more colors to choose from when you buy faux suede duvet covers. This type of down comforter also maintains color better than authentic suede duvet cover. A duvet cover made of silk can make it look classy and luxurious. Silk covers have a rich color because it takes on dyes well. It is a popular choice for consumers because of its elegant appearance and comfort. There are different types of down. This usually depends on the country or area of origin. Down can be made from either geese or ducks. Duck down is higher end as it as it is softer and provides more warmth. Higher end goose down come from white goose. Duvets that are priced lower are usually filled with feathers which can make it heavier. It is also not as soft and warm as down. The highest end down is the duck down called Eiderdown. It is the most luxurious, comfortable and lightweight of all downs. This is perhaps the best choice for a luxurious bedroom. LaJord, goose down produced by the Hudderdite communities in Canada, Zeigler of Poland from high end white goose down and Salzburg of Germany made of white goose down from mature geese. When buying down comforters, check its weight measurement. If a duvet weighs 30 oz, you will know the amount of down the duvet has. The heavier it is, the warmer it will be. However, keep in mind that its warmth also depends on the type and quality of the down. Obviously, a large duvet should be heavier because of its size and not because it should provide more warmth. A duvet’s construction makes a difference in its comfort, warmth and price. There is not a single best type of duvet construction. However, there are simple ways to find out if it is properly made. 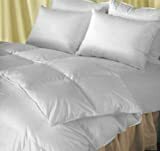 Down comforters that are sewn-through have seams that go all the way through the duvet. This means both sides of the cover are stitched together. It also helps to keep the cover durable and in place. Duvet covers with sewn-through construction are ideal for warmer weather and it costs less than a cover with a more complicated construction. Duvets that feature baffle construction have strips of fabric that form internal walls and these help keep the down in place. Down comforters with baffles cost more than a sewn-through duvet cover but its advantage is that it can eliminate cold spots. This makes duvets with baffles the warmest type of bedding. Down comforters with box construction have seams that are vertical to each other across the fabric. It makes the fabric have down-filled pockets. This is the most common type of construction because it is good at keeping the firm in place. There are a lot of people who prefer channel construction. Its seams run parallel to each other which allow the down to shift to different parts of the cover. You can shift more down to the bottom of the comforter if your feet get cold or perhaps have more down on your side if you are feeling cold more than your partner. When shopping for duvet covers, you can choose from different colors. It is best to choose a comforter with a darker color as it tends to shine through the cover. If you are shopping for a duvet cover for your kid’s room, you may want to avoid light colors as it will be prone to staining. Because light colored down comforters are prone to dirt and dust, you may also find it difficult to keep it looking clean. Most duvet covers can be quite expensive which is you would definitely want to retain its quality. One of the best ways to do this is by washing it properly. Duvet covers should be washed once in a while. Putting your covers in washing machines often might only affect its quality. In fact, washing the covers often can cause fading or damage on the surface because of the intensity of the process. It is important to find out if the duvet covers have been designed for dry cleaning. There are types of fabrics that can get damages when it gets wet. If it is means to be dry cleaned, you may want to take it to your local dry cleaner. Before washing your duvet cover, you should double check if it will fit your basin. Do this by placing it in the basin. If it fits just right, you may want to get a bigger basin as you will need more space for water and detergent to clean it. The comforters should not have messy stains on the fabric before washing it. If you find one, treat it with a stain remover and leave it for a few minutes. When using the stain remover, follow the instructions on the bottle to use it properly. There are many consumers who prefer to buy duvet covers online. If you are sure what brand of duvet cover to get, you may want to read reviews about the best brands from industry experts and consumers. You will be able to buy high quality down comforters from different online retail stores. A buckwheat pillow is filled with natural buckwheat hulls. It's a traditional Japanese approach to a good night's sleep. Great for allergies, comfort and keeping cool. For a beautiful tropical themed bedroom, start with a Hawaiian quilt. Choose from many colors and designs to transform your boring bedroom into an island dream.